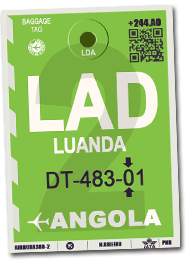 Quatro de Fevereiro Luanda Airport is located south of the historic city center of the Angolan capital, in the district and administrative division of Cassequel. The entrance to the airport is the interchange that crosses two of Luanda's main traffic arteries: the Avenida de la Revolução de Outubro and the Avenida 21de Janeiro. The new airport that will soon be put into service is located 40km south-east of Luanda, on the road to Catete.